This isn't any ordinary heart! 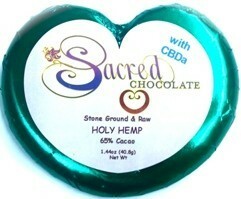 Sacred Steve spent a year on the mathematical design of this custom heart-shaped Sacred Chocolate bar. As a result, the 3-D surface geometry of the special heart shape is built completely out of sacred geometry. Only three elements make up the heart: A plane, an ellipse and a "golden spiral" or logarithmic spiral growing at the rate of the golden ratio--think the Fibonacci series. Why, you may ask, would Steve go through the steps to do this? 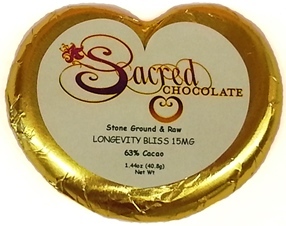 The reason is to serve as a reminder that raw cacao, and especially Sacred Chocolate, is here to help awaken the spiritual hearts within each of us and help heal on all levels. Furthermore, raw cacao happens to be one of the best foods for the circulatory system, containing theobromine which helps dialate blood vessels and acts as a smooth muscle relaxant, along with dopamine compounds that make the blood more slippery. 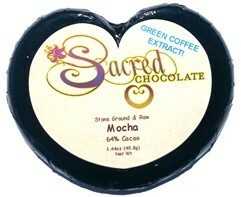 Combining this with the fact that Steve prays over Sacred Chocolate with the intent that it becomes a sacrament to assist in the awakening of hearts and the expansion of human consciousness, is the purpose behind the symbolic heart shape.